I'm watching a travel site slideshow of Iguazú Falls (not coincidentally, a frequent excursion destination for the study abroad program in Rosario, Argentina, where I'll be teaching next fall). 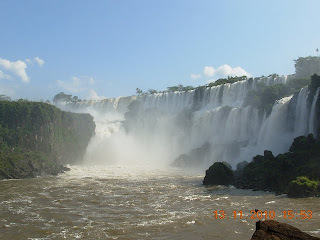 The images are mesmerizing, so I'll leave aside the absurdity of a natural feature having an "official" site and supply the link just for fun (http://www.iguazuargentina.com/espanol/). Falls have their own language, their own lexicon. Not the noise of the falls, though a sound poet might find much to work with along those lines (deafening roar, silence in sound, a pattern that seems constant yet changes, just as the water pours over in a variable yet endlessly similar stream). But I'm thinking of a typology. My daughter once gave me a hiking guide that pinpoints waterfalls across the Pacific Northwest. Stylized icons flag the Plunge, the Horsetail, the Punchbowl, the Block, the Tier. I don't know whether this is a standard subdivision or the unique invention of the guide's author (Gregory A. Plumb, Waterfall Lover's Guide--Pacific Northwest) but I find the variations intriguing. The falls come rated, too, from the single star ("Uninspiring. Probably not interesting except to waterfall collectors") to the 5-star "awe-inspiring sight." I won't try to decipher Iguazú's formal structure from a distance. On the rating scale, though, its place is clear: The Guardian's 2010 Travel Awards rank it the number 1 world scenic attraction (http://www.guardian.co.uk/travel/2010/oct/16/travel-awards-2010). The Diccionario de la Real Academia does not dabble in "cola de caballo" or "cascada abanico," soberly defining cascada as: "Caída desde cierta altura del agua de un río u otra corriente por brusco desnivel del cauce." For a straight translation, the Oxford Spanish Dictionary presents three alternatives: cascada, salto de agua, catarata. Catarata is designated "large," but beyond that the dictionary offers no way to choose among the three. Salto de agua is intriguing in comparison to the English fall-- my first associations with salto suggest jumping, upward motion; still, one might jump (down) off a cliff as well as up onto a table to dance. The water leaps into space and tumbles down. I have never met a waterfall collector, though I've taken more than my share of waterfall photographs. And I'm a sucker for specialized word lists--I do collect those. Las Cataratas del Iguazú, at the borders of Argentina, Brazil, and Paraguay, should offer plenty of opportunities to broaden my waterfall vocabulary into Spanish, Portuguese, or Guaraní. So now I'm looking for a list of waterfall forms in Spanish. Suggestions welcome! I used to collect snow globes. They fit very nicely on the plastic frame that covered the florescent light above the bathroom sink. Every now and then I'd pause while brushing my teeth and give a bunch of them a shake so I could watch the miniature blizzards while I rinsed. Then we moved to a new house and I had nowhere to display them. Now they're stashed away in a box. I can't even imagine a home that could comfortably accommodate a collection of waterfalls, no matter what the collector called them. I love the idea of house that would accommodate a waterfall collection. I might have to work on that. Nothing you could stash in a box, like snow globes. Nothing that would leak. But a generous, malleable space. Maybe waterfalls can be folded, like road maps, and stored in a drawer. The collector would have to remember her hooded raincoat and rubber boots before she opened them, though. So what do you call this place, anyway?